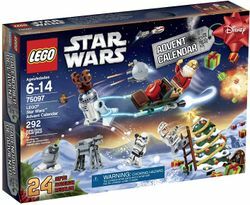 75097 Star Wars Advent Calendar is a Star Wars set released in 2015. It features models such as a sandcrawler, probe droid, sarlacc pit and Jabba's sail barge. This is a description taken from LEGO.com. Please do not modify it. 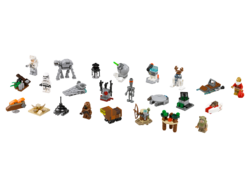 (visit this item's product page) Journey through the Star Wars™ galaxy in the countdown to Christmas! Makes a great festive gift for humans and Sith Lords everywhere! Facts about "75097 Star Wars Advent Calendar"
This page was last edited on 15 March 2016, at 06:07.